How to Install and Maintain Air Conditioning Units? How to Maintain Air Conditioning Units in Daily Use? What You Should Know When Assembling Air Conditioning System? How To Check If Installing Air Conditioning Units Correctly? Why Air Conditioning Units Will Become Smelly? 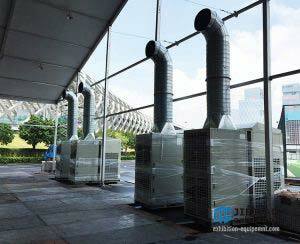 Why You Should Add Refrigerant into Cooler Air Conditioner? Electric Heater Air Conditioner Doesn’t Work? 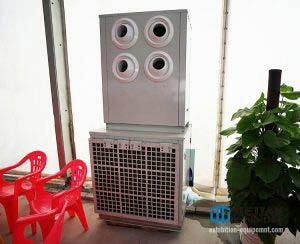 Packaged air conditioner unit is an air treatment equipment for cooling, heating, dehumidifying, and purifying, etc. The package unit air conditioner does not have the cold and heat source. And its cooling medium is water or steam. 1. To check that whether the fan, motor and other electrical equipment are in normal state. and regularly to bearing oiling, regularly check the adjustment tight fan V-belt. 2. To clean the breakwater, heater and cooler periodically. And to check or replace the nozzle (once a half year). One more thing is to clean spray section water tank and water filter every two weeks. 3. When the filter resistance is above 0.15kPa (H20 15mm), you should replace one. 4. You should drain out the water before using the heater and cooler. To wash the inner surface of pipes using chemical method every two years. 5. The panel frame and all metal parts should be derust and paint once a year. Whether assembling air conditioning system correctly or not can affect the cooling effect and its electricity consumption. Here are some tips. 1.Connecting copper pipe between indoor and outdoor unit is easy to be broken, which causes poor circulation. 2.There will be some ducts if you packed the bare copper pipes not correctly, which causes cooling system block. 3.If you don’t exhaust air after assembling, it also causes poor cooling effect and risk of ice block. 4.If adding too much refrigerant, it will burn the compressor. However, the cooling effect is bad while adding too little . 1.Wrap the cooper pipe head well with the tape to prevent dust from going inside. 2.Circle the cooper pipe well to avoid folds and crack, which will cause poor circulation or fluoride leak. Before installation, please check the pipe, power wire, condenser pipe. 3.To fix the chiller air conditioning on the horizontal level to avoid condensation water flow back to the air outlet. 4.When connecting the outside unit, remember to exhaust the pipe to make sure no air inside. Otherwise the air will mix with refrigerant to cause poor cooling effect. Moreover, pack the connecting pipes vertically and horizontally. Firstly, the outdoor unit should be level. This is important for proper distribution of oil for lubricating the compressor. Secondly, the outdoor unit should have a solid base. And there should be an electrical disconnect within 3 feet of the outdoor unit. Thirdly, the outdoor unit should be about one foot away from the house. This is to allow proper air circulation through the condensing unit. Without proper airflow, the unit will have higher operating pressures which cost more electricity. Moreover, there should not be any scraps or trash from the installation left laying around. Firstly, you should insulate the large copper line running from the outdoor to the indoor unit of the chillers air conditioning. And there should not be any tears in the foam insulation. This is important for maintaining efficiency as well as for proper compressor operation. Secondly, the copper lines should have supporters about every four feet. And to ensure that there are no sagging places in the lines. Thirdly, the copper lines should be as short as possible. And the copper lines should be normally the same size as the connections on the unit. Moreover, both the main and emergency drain connections on the indoor coil should be connected to a suitable drain. The indoor screen and copper of air conditioning units portable will squeeze some dust after years of usage. When squeezing to a certain amount, it will have a certain smell. So smell will drift into the air when turning on air cooled system air conditioning. In many cases, there will be moisture in the interior of the indoor unit. When you turn off the air cool chiller, it will immediately stop operating, which makes smelly moisture pile up. Some places like computer rooms and hotel rooms use air supply end that have no efficient air filter system. Although the interior decoration in these places looks beautiful, the interior will also adhere to dust. Moreover, high humidity and temperature around the coil make it suitable for microbial breeding environment, which produce smell. Nowadays, people pay more attention to healthy and eco-friendly products when purchasing cooler air conditioner. Everyone knows that air conditioners need to add refrigerant to operate, but what is it and why? Refrigerants are the medium for transferring heat in space coolers refrigeration systems. The heat can not be effectively exchanged without it. Air conditioning also can not be cooling or heating. Therefore, once the air-conditioning is lack of fluoride, it will heat and cool poorly, leak water, and shutdown. However, there are some problems you may not find out immediately such as shortening the usage life of the portable cooling unit, wasting electricity, damaging air conditioning compressor. That’s why the refrigerant is a must for a portable cooling system. The reason why portable cooling units can refrigerate is that the fluoride evaporate to absorb heat to cool down. If there are too much fluoride, it won’t evaporate in connector tube instead of the indoor unit. It can not achieve cooling effect and shutdown. It could be very troublesome when electric heater air conditioner doesn’t work, especially in cold winter days. Therefore, you should check it at least every month. Generally, the reason why electric heater industrial works bad may be too much dusts in the filter. They will reduce the air volume, resulting in machine heat not being brought out by air and insufficient heating capacity. You should clean the air filter regularly. Fluorine deficiency may be another reason. When it is very cold outdoor, the heat changing process runs very slow, causing less hot air. 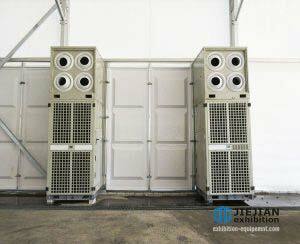 Therefore, when the outdoor temperature is below 0 ℃, there will be no satisfied air conditioning heating effect. Moreover, if assembling not properly, it may cause lack of fluoride. Many people may wonder why commercial electric heater doesn’t work in winter? In fact, there are cooling components and heating components. So the cooling function being normal while the heating being abnormal would happen. The reason may be some faults in the heating components.